Again, most farmers will not price all grain in the “first half” or “September”, but will be closer to “farmdoc Budget Prices” by marketing throughout the year. With farmdocbudgeted prices, 2018 net income is $80,348 for an average central Illinois grain farm. This is approximately double the net farm income projected using the model in June (see farmdoc daily, June 26, 2018). The impact of the ongoing trade conflict will show up at the farm level, with timing dependent on marketing. Farm incomes may be sufficient to build working capital in 2018 for farms that have exceptional yields and did some pre-harvest pricing. MFP payments are also important in building 2018 working capital. The building of this working capital will be needed to offset projected losses in 2019. Hopefully changes in market conditions will cause 2019 incomes to look less negative. Schnitkey, G., J. Coppess, N. Paulson, K. Swanson and C. Zulauf. “Market Facilitation Program: Impacts and Initial Analysis.” farmdoc daily (8):161, Department of Agricultural and Consumer Economics, University of Illinois at Urbana-Champaign, August 28, 2018. Swanson, K., J. Coppess and G. Schnitkey. 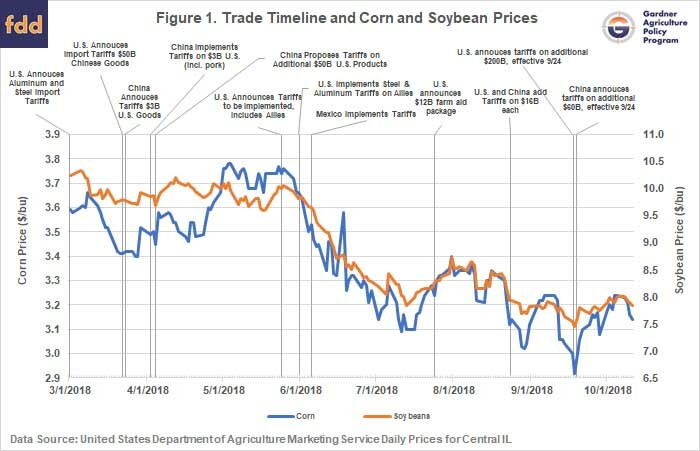 “Trade Timeline and Corn and Soybean Prices.” farmdoc daily (8):141, Department of Agricultural and Consumer Economics, University of Illinois at Urbana-Champaign, July 31, 2018. Swanson, K., G. Schnitkey, J. Coppess and N. Paulson. “Five-Year Income Projections for Grain Farms.” farmdoc daily (8):117, Department of Agricultural and Consumer Economics, University of Illinois at Urbana-Champaign, June 26, 2018.